This is what a Broncos fan's home looked like before thieves stole all of the football themed decorations. Someone in the Denver area is tempting fate when it comes to the Broncos. 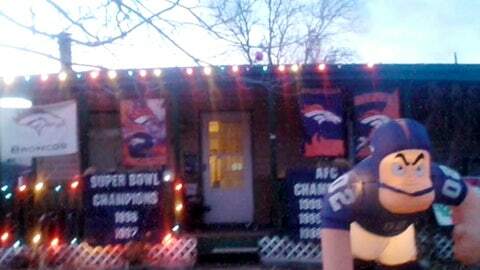 A family of die-hard Broncos fans woke up to a yard full of team decorations stolen. The thieves took off with all sorts of loot including an inflatable football player. But what super-fan John Smith is most angry about is the two championship banners that once hung in the Mile High Stadium that were taken from the house. The thieves swiped the doormat, too. A local news station in Denver talked with the unlucky Broncos fan and his daughter about the theft. Even though the police are involved, all the family wants is for someone to return the banners.